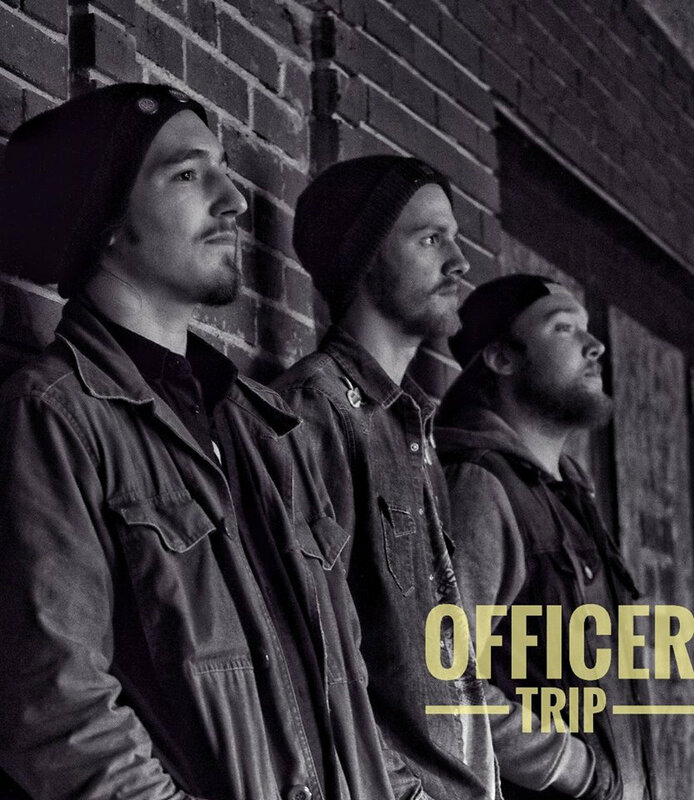 Officer Trip are a punk power trio based in Port Coquitlam, British Columbia. After initially being formed by guitarist/vocalist Taylor Vesper as a solo project, bassist Bryan Bridge and drummer Taylor Butters were swiftly recruited to complete the full lineup. After an extended period of writing original material and playing live, the band decided to take the plunge and record a raucous debut album entitled ‘Straight Goods’, which was released in 2017. Keen to out-do themselves, the band wasted no time in writing and recording a follow up, which was released the following year. The resulting product, ‘Motherland’, effectively presents a confident and ‘no-nonsense’ band with a huge amount of potential. The album wastes no time in getting started, kicking things off with the blistering metal-influenced track ‘Whisper’. A catchy, distortion-drenched guitar riff introduces the track, before the rest of the band enthusiastically join the ear-splitting arrangement. This track effectively displays one of the band’s strongest selling points; their phenomenal musicality and chemistry as a unit. Vesper and Bridge play the main riff in perfect unison, showcasing a cut-throat sense of rhythm and a real sense of chemistry between them. Butters’ drum part features some fantastic double bass work, accenting key sections of the riff without becoming overbearing. This shows he’s clearly kept the needs of the arrangement at the forefront of his mind whilst composing his part and displays an excellent sense of musicianship. This is something I’d strongly urge the band to place at the forefront of their marketing as it’s a very notable trait. ‘Last Call Professionals’ features more of a classic rock n’ roll influence, making use of a common 1950’s rock progression and a larger-than-life main riff. Particular praise on this track goes to Vesper for some incredibly-accomplished lead guitar fills; he makes use of breaks in the main riff to showcase a range of well-executed techniques, including hammer-ons, pull-offs and harmonics. This shows he’s clearly put the time into learning the instrument to the best of his abilities, showing good dedication and attention to detail. ‘Ice Cream’ is a more pop punk influenced track, making use of ambient guitar lines and a catchy lead vocal melody. My attention turns to Vesper’s vocal delivery, which is overall very good. His lyrics are primarily screamed, showing a real sense of passion and anguish that’s very well-suited to the band’s genre. His delivery is also consistent across the entire album, effectively gluing the tracks together as a cohesive body of work. However, I think the vocal parts could really be livened up by a strong backing vocal arrangement, which I’ve noticed the band very rarely make use of on this album. I firmly believe this would add a real sense of presence to their material, enforce key lyrical moments and also aid in filling out the midrange that they aren’t obtaining from a second guitarist. ‘Your Song’ is a more laid-back track, featuring an array of particularly strong guitar and vocal melodies. The track is excellently brought to a climax at the golden ratio section; the arrangement drops down to a folk-influenced guitar line, before being joined by sustained overdriven guitar chords, off-time drums and a melodically-sound bassline. This is very well-executed and shows good arranging and composing skills from the trio. ‘The Coast’ continues in the same vein as the previous track. However, it interestingly sees the the band launch into double-time for the bridge, before returning back to the laid-back full-time groove for the remainder of the track. I thought this was an interesting move, showing a good sense of variety at the crucial midway-point of the album. My attention now turns to the band’s adherence to the power trio format, which is overall very good. Vesper’s guitar tones are full-bodied and well-balanced, whilst Bridge’s are sharp and trebly. This effectively fills out the midrange section and contributes to a larger-than-life sound. Butters makes use of detailed tom fills and a heavy delivery, excellently upholding the momentum of each track and truly gluing the arrangements together. As previously mentioned, I’d strongly urge the band to make more use of backing vocal arrangements in order to further fill out the midrange and add a sense of presence to their material. ‘Comfort’ is another more laid-back track, featuring influences of alternative rock. Particular praise goes to Bridge for an excellently-written bass part; he provides a wonderful counter-melody to the lead guitar line, providing solid infrastructure for the main guitar riff and booming floor tom beat to sail through the arrangement. This again shows good attention to detail as well as an accomplished sense of musicianship. Bridge continues in the same vein on ‘Waitress’, providing yet another effective counter-melody to the blues-influenced track. Vesper also once again showcases some fantastic blues-influenced lead guitar work on this track. At this point, it becomes apparent that Vesper truly shines on the more blues-influenced tracks; his lead guitar work is tasteful and his vocals have a real heartfelt and genuine quality to them. As a result, I’d very much encourage the band to ensure they continue to compose blues-influenced tracks. ‘W.H.E.R.E’ is the most vulnerable and intimate track on the album, making use of an interesting picked guitar line sat atop a somber floor tom beat. My focus now turns to the band’s sonic identity, which is overall very well-formed. Whilst the band experiment with a few different genres across the track, the album feels connected through the band’s established signature traits. These include screamed lyrics, bluesy lead guitar work and melodic basslines. I’m very much looking forward to seeing how the band continue to refine their genre and further develop their signature traits in order to carve out a fully-formed sonic identity on future releases. It’s also worth noting that their visual identity is very well linked with their sonic identity; the band’s main promotional picture sees each member sporting a hat, denim jacket and beard. This look is very appropriate for the music they create and comes off as very professional. The second-to-last track on the album is a re-worked version of ‘Glassroots’, which was originally featured on ‘Straight Goods’. The guitar work on the track has been given a complete makeover, truly bringing the arrangement to life in a way that the original version didn’t quite do. This shows the band have a good ability to reflect on their previous work and improve things accordingly. At this point, my attention turns to the album’s production, which is overall very good. All instruments are very well-recorded and it’s clear the band have taken the time to source appropriate tones and takes at the source, leading to a very convincing final product. The mixing takes a very ‘hands-off’ approach, keeping effects to a minimum. This suits their more punk rock sound fantastically and shows a good awareness of the requirements of the album. The mastering work is also very good, with the production having a consistent feel to it from track to track. The album rounds off with the blues rock title track, ‘Motherland’. The extended instrumental sections on this track are particularly notable and continues to showcase the band’s excellent sense of musicianship. As the track draws to a close, I’m left with a feeling of satisfaction and a keenness to hear more from the band. Overall, ‘Motherland’ effectively showcases a fantastic set of songs from a talented group of musicians that are keen to grow and improve at every available opportunity. Highly recommended for any fans of punk or blues rock.